In lieu of flowers memorial donations may be made to Coal Hill Cemetery and left at the funeral home. 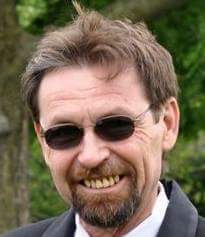 Terry “Pete” Loren Wood, age 59, of El Dorado Springs, MO, passed away Tuesday, April 21, 2015. Terry was born September 19, 1955, in El Dorado Springs, MO, to Loren Clifford Wood and Henrietta Irene (Gilpin) Wood. Terry married JoAnna Mae Parks in June of 1974. To this union two daughters were born. They divorced in August of 1984. He worked as a steel worker for most of his life, in El Dorado Springs and Springfield, MO. Nascar racing was his favorite sport. He never missed a race on TV and attended as many live races as he could. He enjoyed spending time with his daughters and made every moment count. That didn’t end with his daughters, but continued with his five grandsons who knew him as “Grandpa” or “PaPa Candy.” He enjoyed listening to music and playing guitar. Preceding Terry in death were his parents, Loren and Henrietta Wood; sister-in-law Georgia Wood; niece Melissa Baggs; and great-niece Caitlyn Baggs. Survivors include: daughters, Brandy Mooney and husband Jake and Jamie Morgan and husband Austin; siblings: Steve Wood and wife Peggy, Lloyd “Smiley” Wood and wife Samantha, Mike Wood and wife Pat, Connie Goodwin and husband Johnnie, Bill Wood, and Lori Brooks and husband Tim; five grandsons: Gavin and Caleb Mooney, and Payton, Axton and Tyler Morgan. Funeral services for Terry Wood will be held on Monday, April 27, 2015, at 2:00 p.m. at Bland-Hackleman Chapel, with Rev. Brent Bland officiating. Burial will follow in Coal Hill Cemetery under the direction of Bland-Hackleman Funeral Home. Pallbearers are: Austin Morgan, Jake Mooney, Lloyd Wood, Bill Wood, Steve Wood, and Mike Wood.